Flagging down the number 59 bus outside of Don Mueang International Airport is a little harder than expected. We are standing on a 2ft wide sidewalk on a busy highway with more buses than we can imagine speeding along with taxis, cars, and motorcycles all paying little to no attention to any traffic rules. To make matters worse, it’s dark outside and we are trying to spot the dimly lit number on an ancient bus that specifies which one it is, and flag it down. Yes, flag it down, because they do not stop at the “bus stop” unless someone is adamantly waving them down. 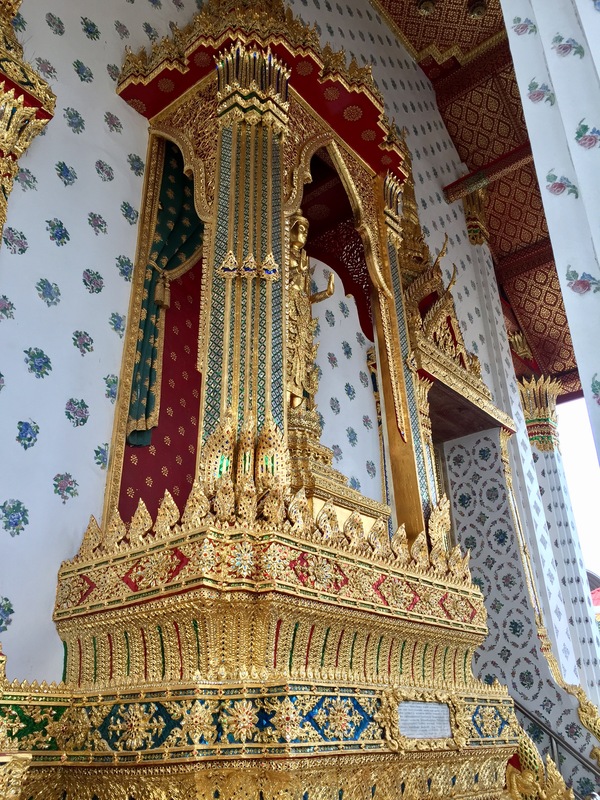 Eventually though it finally comes, we spend the next hour riding the rickety but reliable local bus through Bangkok until we are ushered off the only bus that actually goes directly to Khao San Road. The driver apparently was finishing his shift and sent everyone off, but kindly pointed to another bus to get us where we wanted to go. Soon we were let off near our hostel and walked the last little bit to check-in. 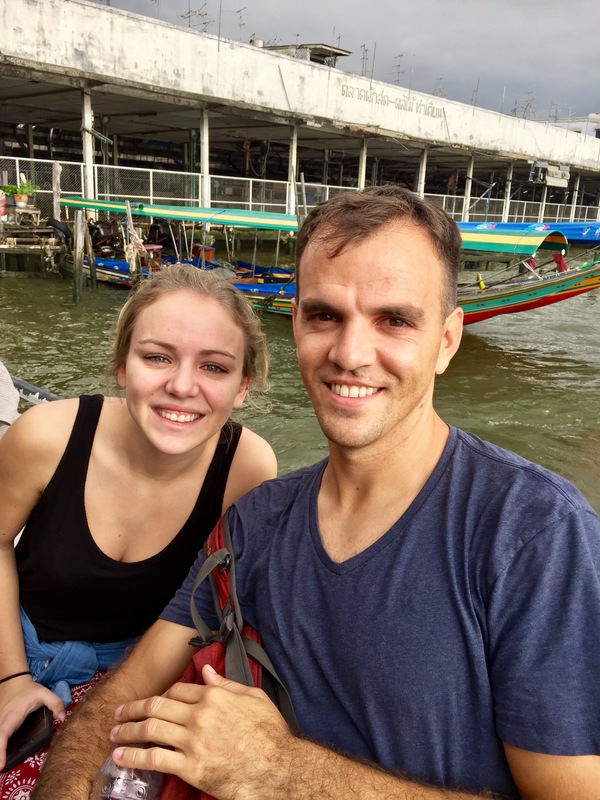 My youngest sister Lilli would be meeting us for the next part of our trip as we toured Bangkok for Round 2 and then head south to see the beaches and islands of southern Thailand. With this in mind, finding a 3 person room isn’t that easy, so we settled for 3 beds in a 4 bed dorm room in d Hostel. We chose this brand new place for the next few days since it was within walking distance to all the main tourist sights and it had great reviews online, but the actual neighborhood itself was quite interesting at night. Whitney and I were walking the last few blocks in the darkness passing a variety of people presenting their best entrepreneurial skills. From the bamboo mats spread across the sidewalks with signs indicating the massage prices to the sleek and sometimes scandalous dressed individuals waiting to do “home visits,” I can say it was something to be missed at night. Also, I was blocking out the idea that I would be meeting my sister in a couple hours and then coming right back into this neighborhood. Well, we have sure seen a lot in our travels, so we just carried on from there. 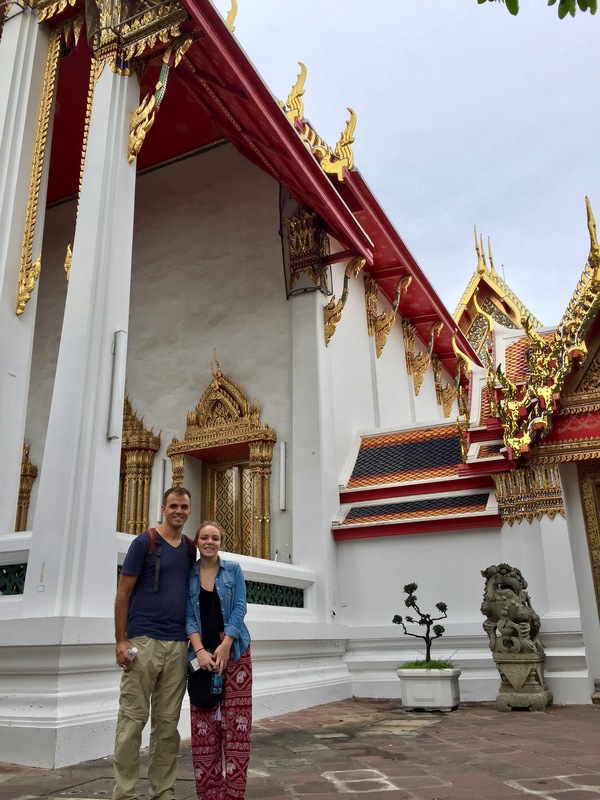 After a quick bite at a street food cart in front of the local 7-eleven, it was time to head to Bangkok’s other airport, Suvarnabhumi Airport, to pick up Lilli. Again, we took a chance and boarded another local bus toward the Skytrain and successfully made it to the airport for the much anticipated arrival of Lilli. What a fresh and welcomed smile as she came strolling out. It was just after midnight as she arrived, so we caught a taxi back to our hostel to finally call it a night. Now, Lilli only had about 2 weeks with us so we had to cram as much fun into a short amount of time as we could. 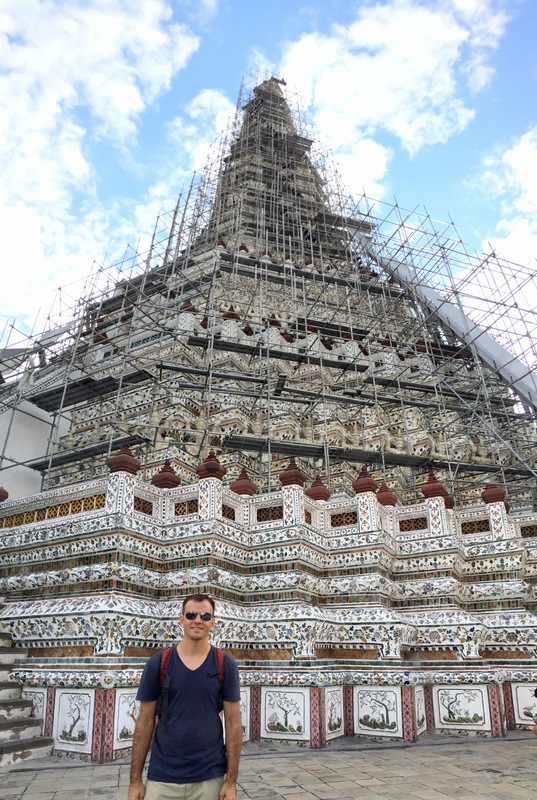 So, having done a bit of research especially during Round 1 in Bangkok, we had only 2 full days to see the sights before heading out. With that in mind our first day started out a little early considering the expected jetlag and after midnight arrival. We scrambled to get breakfast then anxiously set off in the morning. 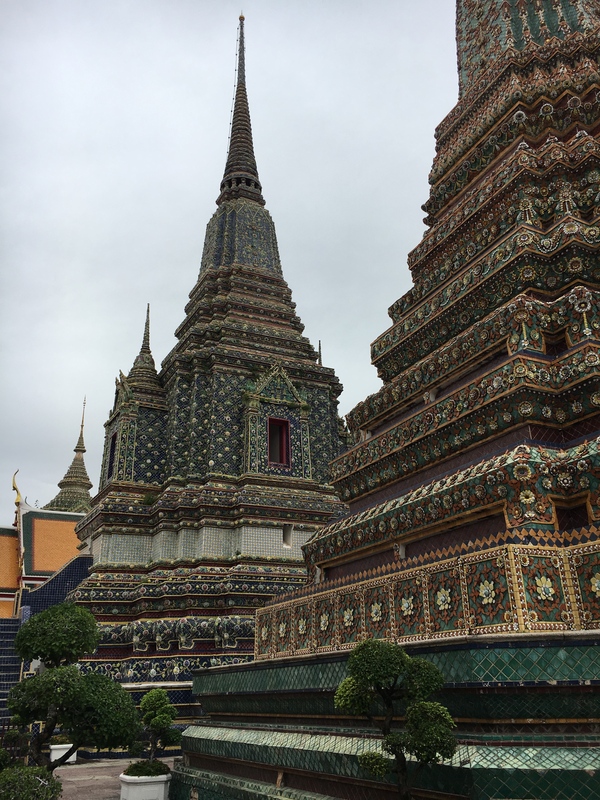 Our first destination of the day was Wat Pho (Officially called Wat Phra Chetuphon Vimolmangklaram Rajwaramahaviharn, which explains the abbreviated version). 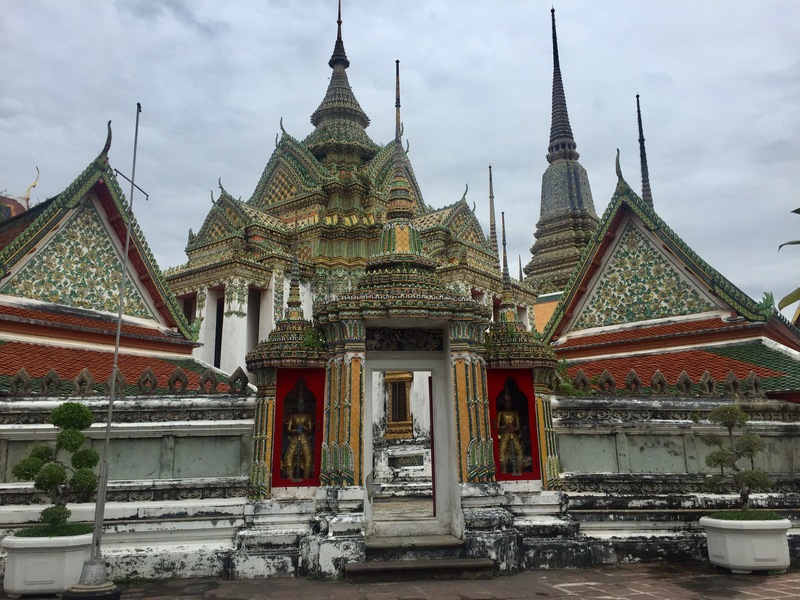 Having already seen a number of temples as we crossed through Southeast Asia, this was still one worth adding to the list. 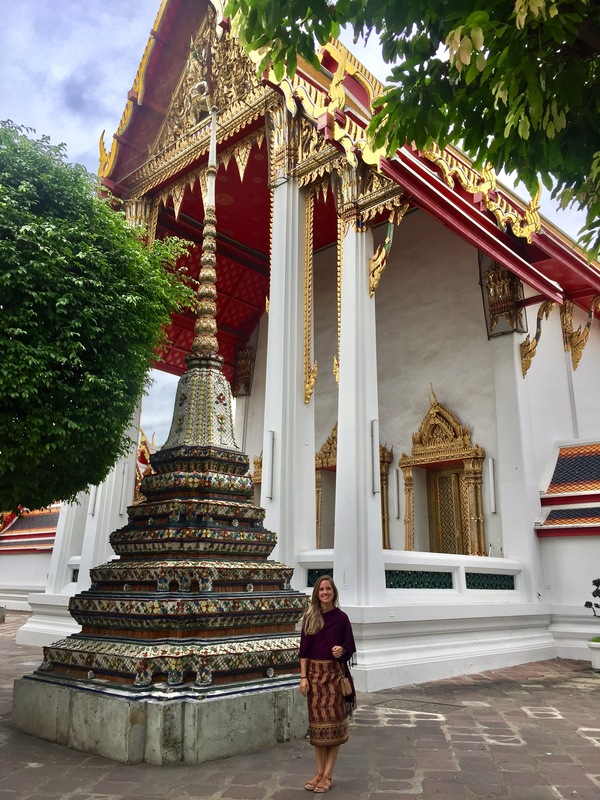 This is one of Bangkok’s largest and oldest temples and is home to the impressive 46 meter reclining Buddha, which is where it gets the name “Temple of the Reclining Buddha.” Lilli was certainly impressed after visiting her first Buddhist Temple ever. 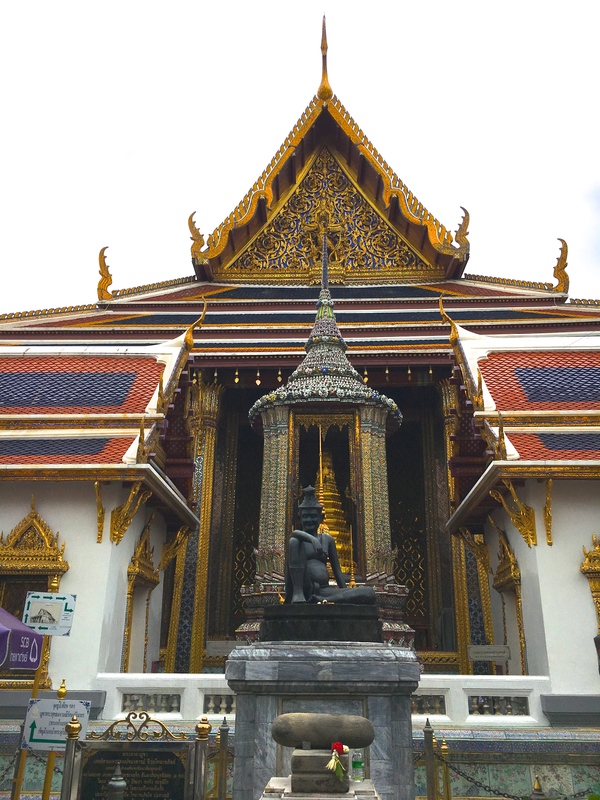 It was lunchtime as we left Wat Pho, and the Grand Palace would be closed for a few hours so we decided to venture out away from the tourist crowds to find some authentic Thai food. After a bit of a trek through the apparent electronics section of Bangkok where men have their tents set up on the sidewalk rebuilding speakers, cable boxes, TVs, radios, and whatever else they have parts to, eventually, I spotted a soup noodle cart strategically placed at the opening of an alley way. Within seconds the owner recognized my attempts to point out what we wanted without speaking Thai, then offered in perfect English “you want the noodle soup, will that be with pork or chicken?” Slightly embarrassed, I responded, “Chicken please” and then we made our way down the alley to the few open stools to wait. It was just as expected, authentic and incredible. 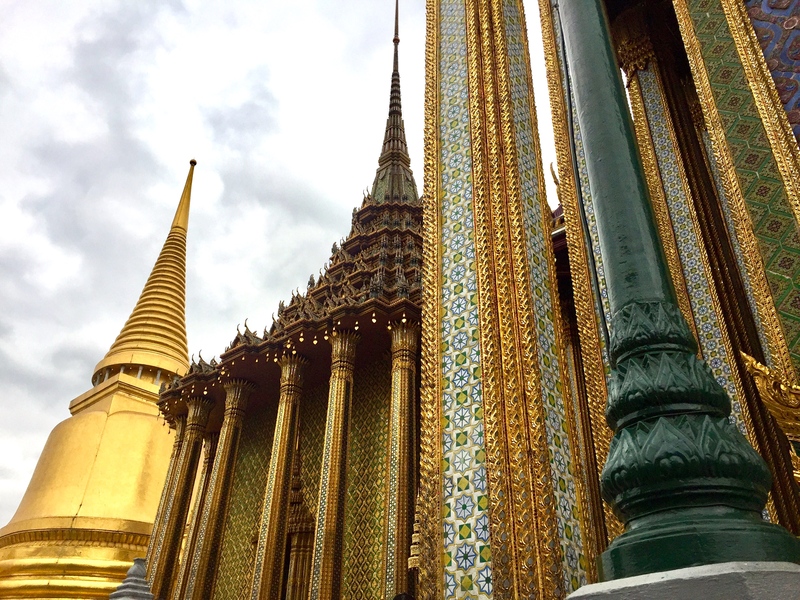 We made our way back toward the Grand Palace after lunch, clearing security and making the long walk to the entrance. 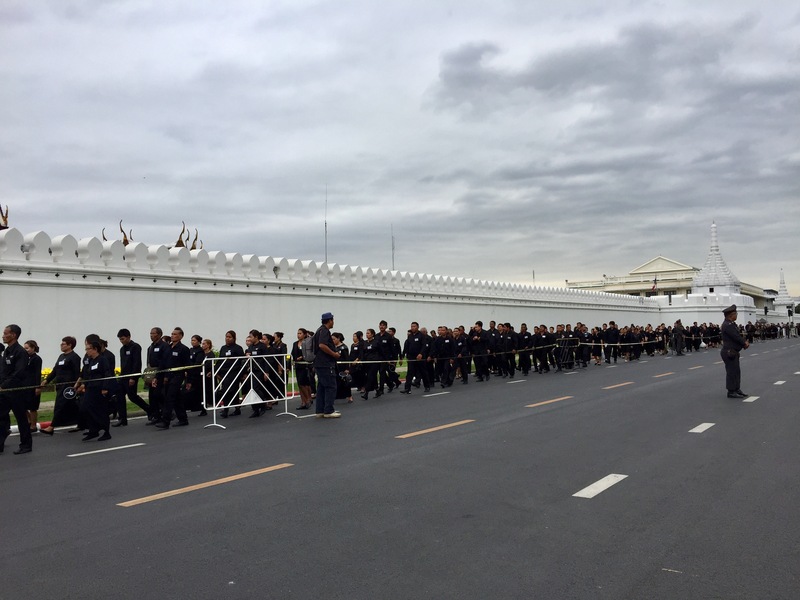 Following the recent death of King Bhumibol the Great, Bhumibol Adulyadej, there had been a steady stream of local Thai people making their way through the Palace to pay their respects. The people truly respect this great monarch and it is nice to see such tremendous support for the country’s leader. 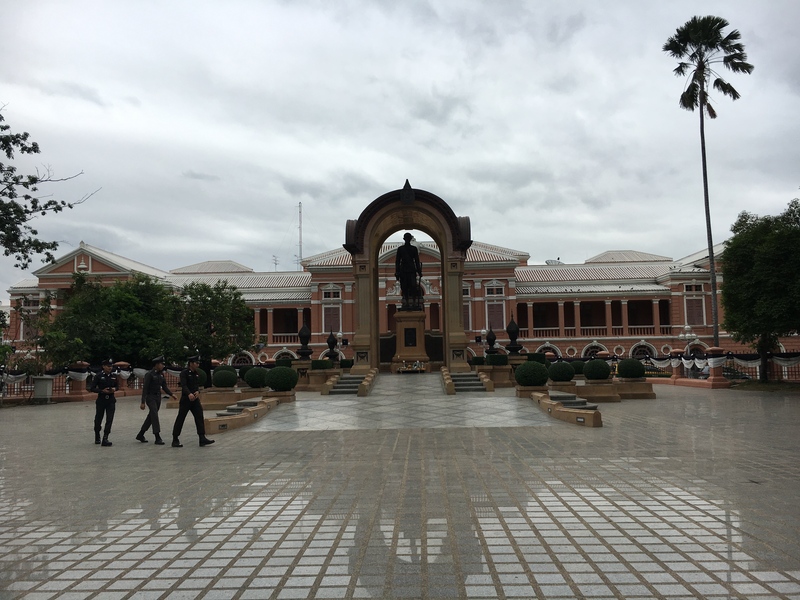 However, as tourists we were only allowed to see a small part of the estate and unable to join the procession, not that we would really understand the significance as a foreigner. 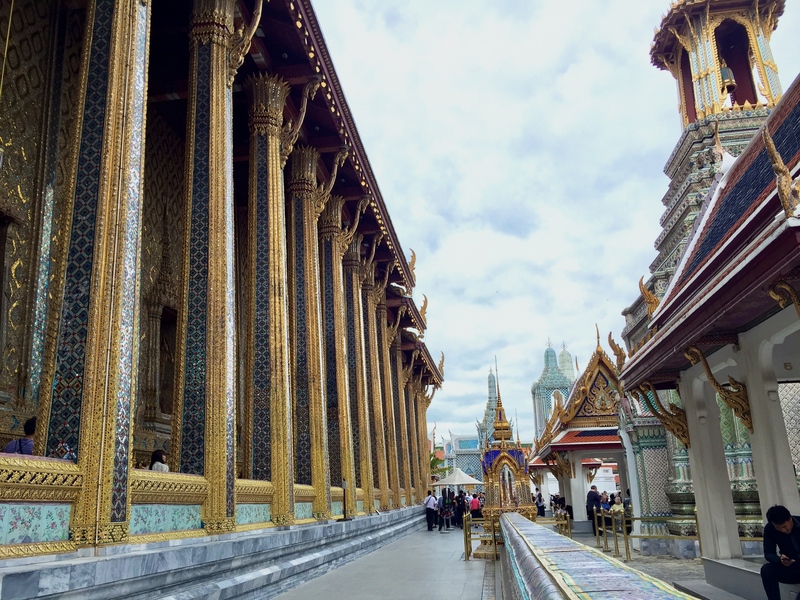 We were thus limited to the outer courtyard, the Temple of the Emerald Buddha and a couple of small museums all of which is a must. We made our way through the gates and security just as the rain began. 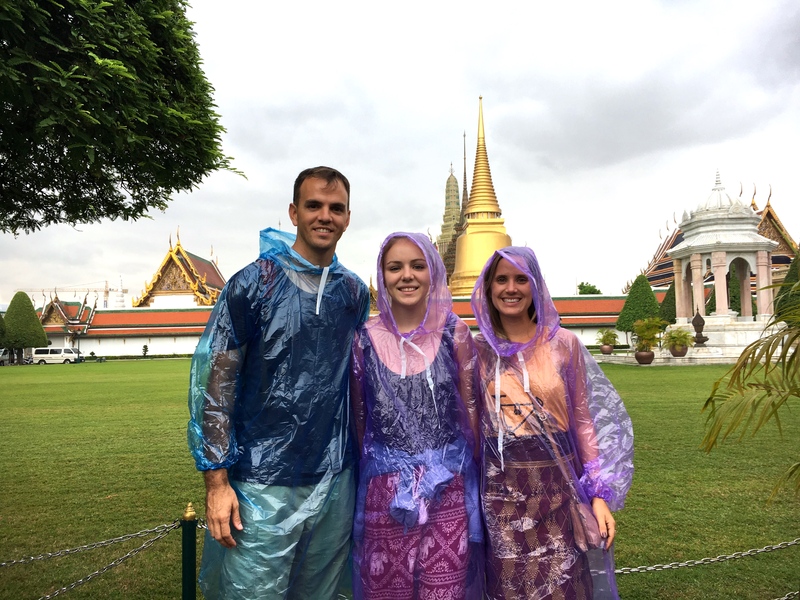 I spotted a few ponchos, made our purchase, and then headed into the temple first. 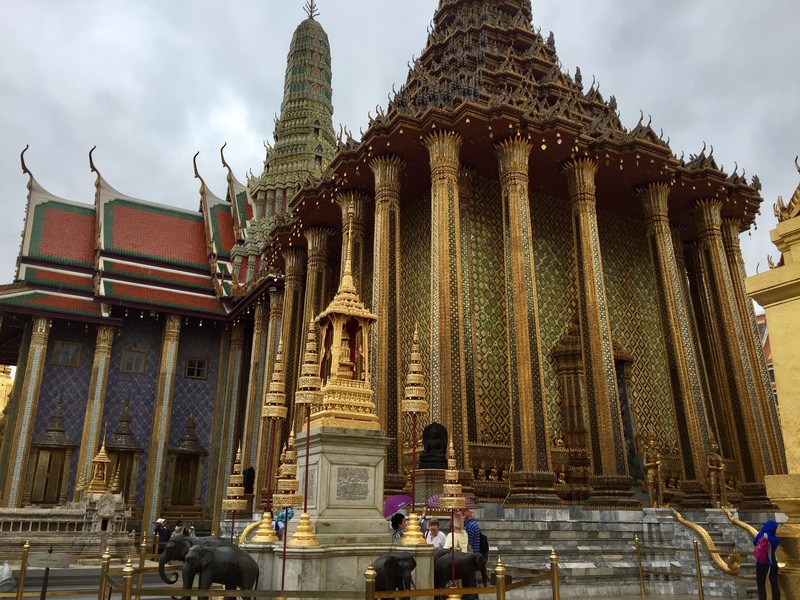 Seeing as the temple is within the walls of the Palace it is well maintained, quite impressive, yet a bit crowded even on a rainy day. We still enjoyed checking it out and snapped plenty of pictures to remember the trip. 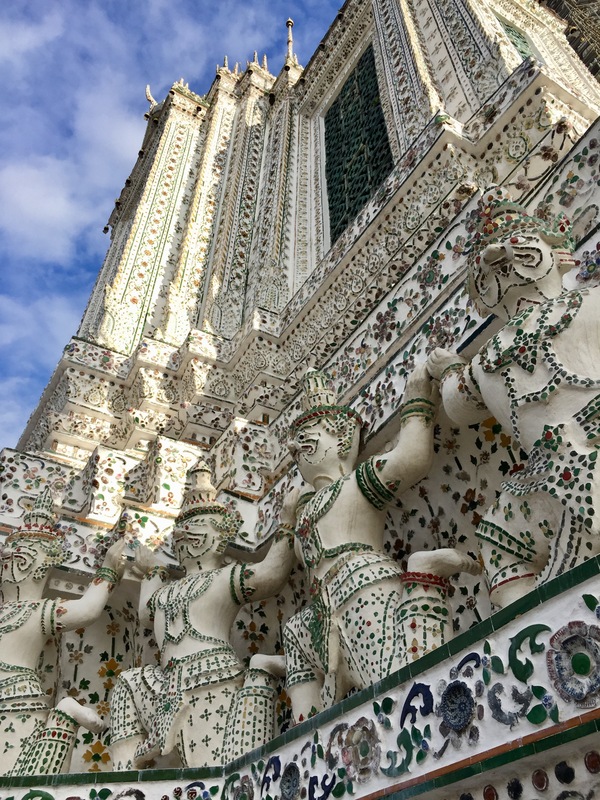 The rain seemed to be tapering off as we finished touring the Grand Palace, so we headed to our final tourist destination of Wat Arun, just across the river. 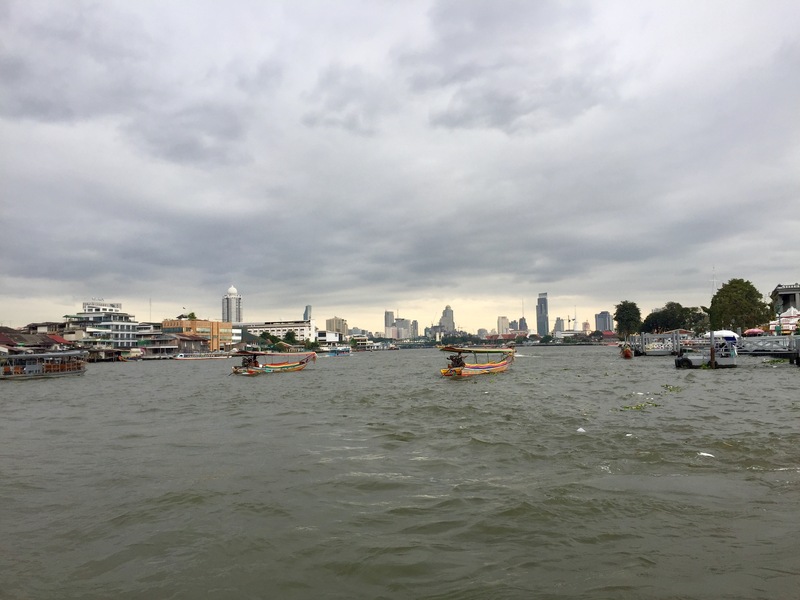 Tip: there is a ferry that goes across the river every few minutes for only a few Baht per person, so don’t get caught up in some tourist boat. 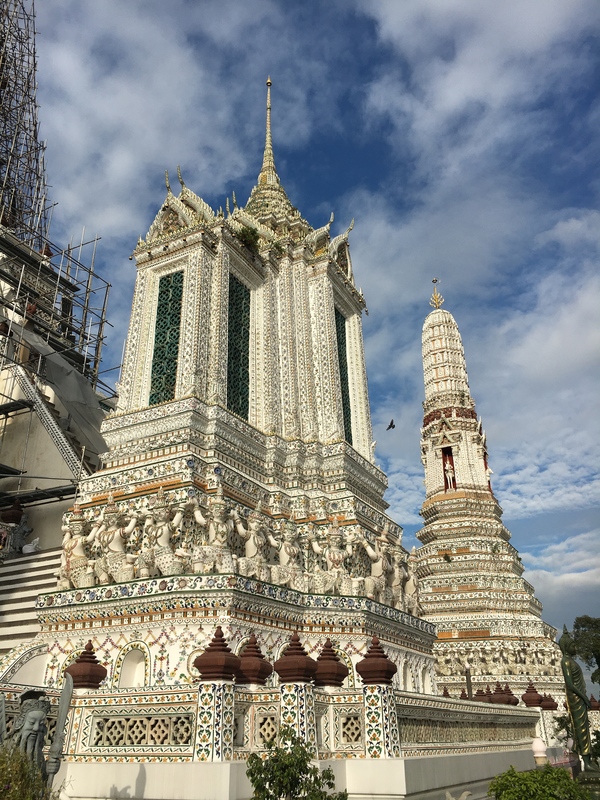 At the time we were visiting, parts of this temple were undergoing renovations with scaffolding covering some of the most impressive parts. 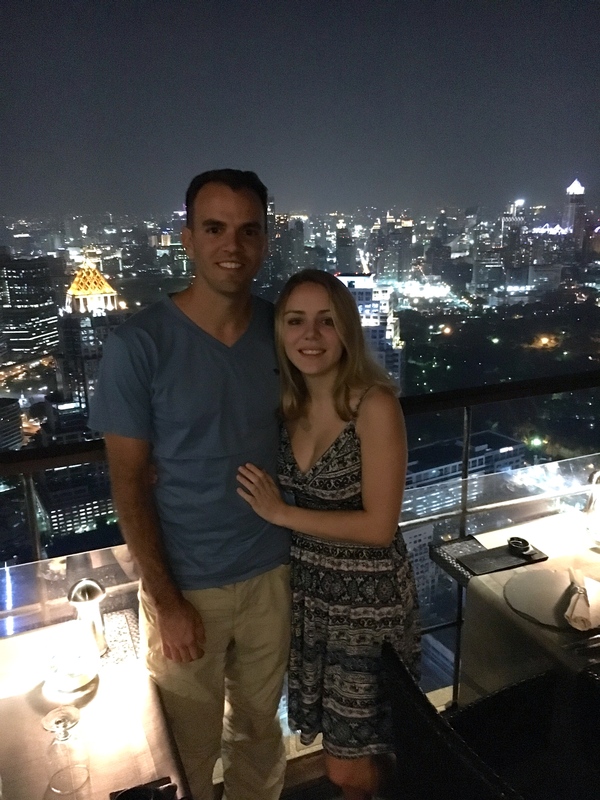 With no other plans and knowing it may be a long time before we would ever be back, we made the most of it. 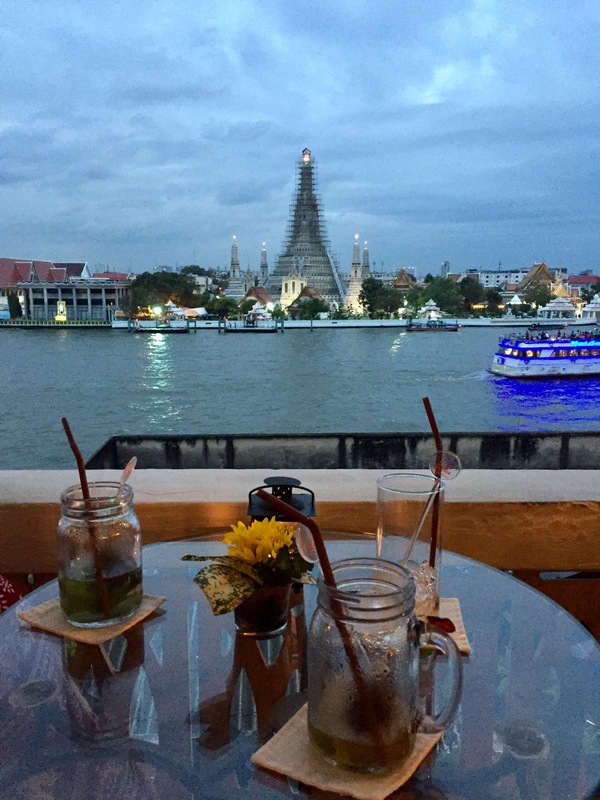 Afterward, we took the advice of a friend and found a riverside restaurant to watch the sunset behind Wat Arun. It’s too bad the clouds rolled in covering up our anticipated views. 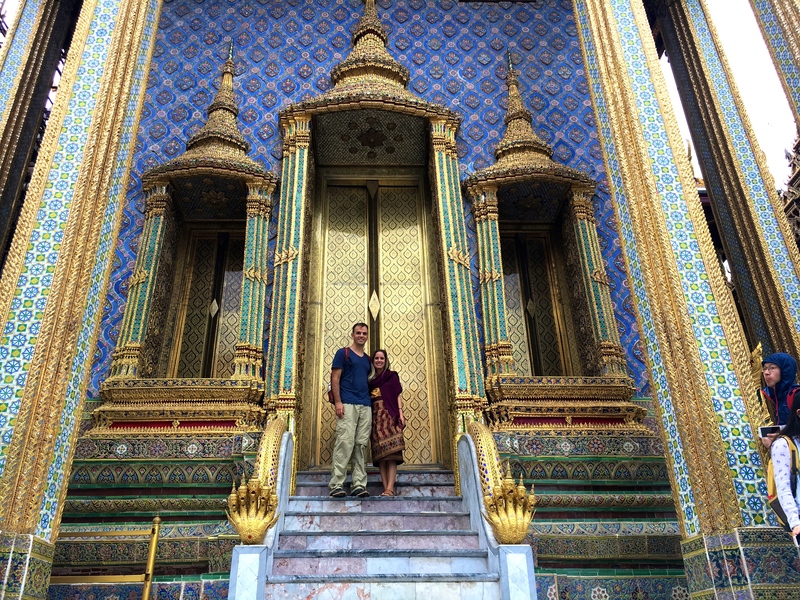 We still enjoyed a twilight drink then caught the ferry down to the BTS train to head over to our favorite masseuse. The ferry let us off beneath the train and we headed toward the entrance. 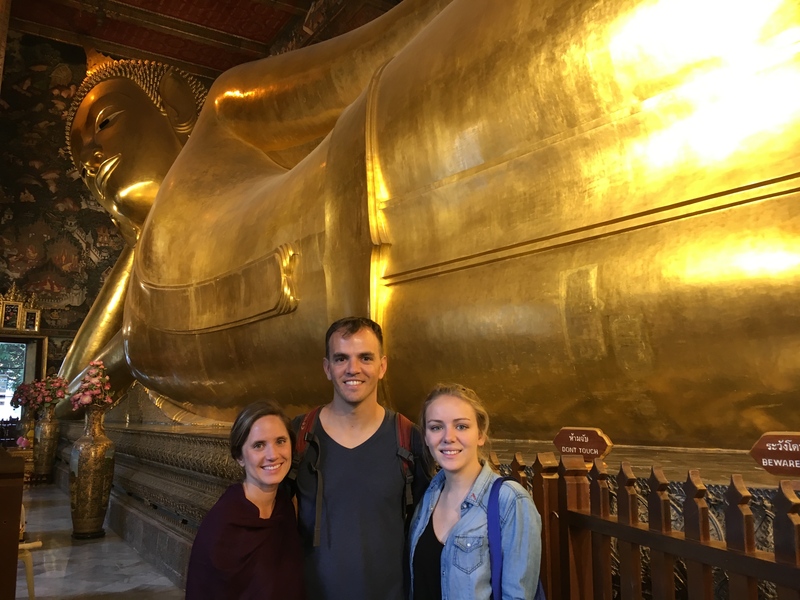 With Whitney and Lilli following me through the crowds, I skipped right past the train entrance to grab one of the best treats we have had in all of Southeast Asia. There is a little spot on the roadside making some miniature coconut milk pancakes. 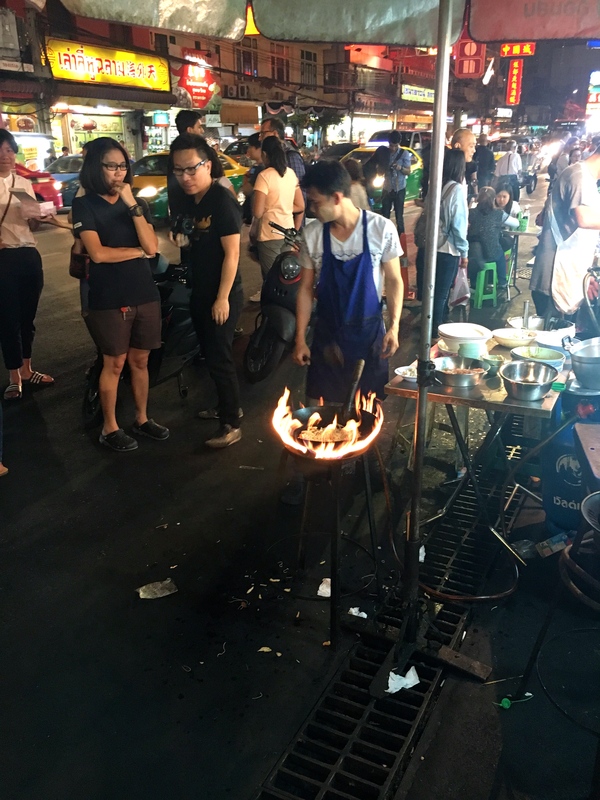 Besides the meat on a stick for 10 baht, I’m always on the lookout for these. I got us a fresh batch of this tasty treats then went back to the station to ride toward the mall. 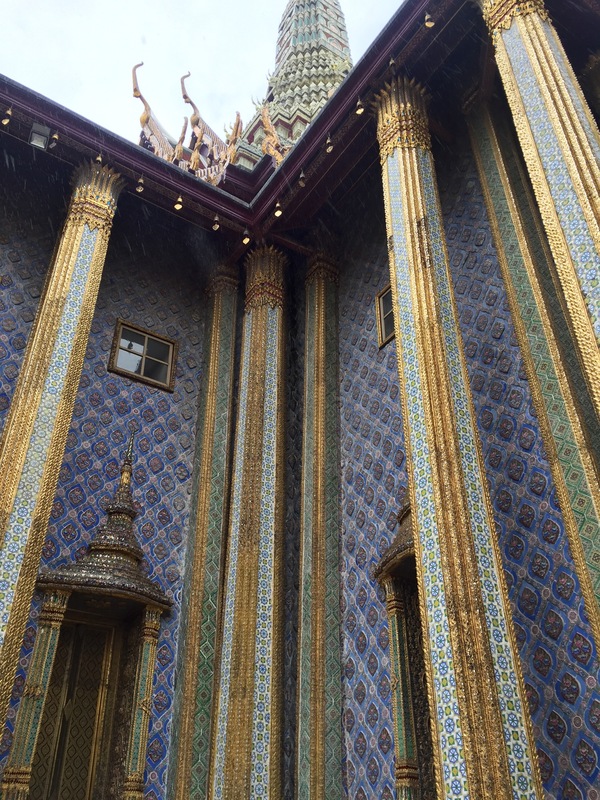 Our destination was Lek Massage House for a spectacular and much needed 60minute traditional Thai Massage. It was so good to be back!! 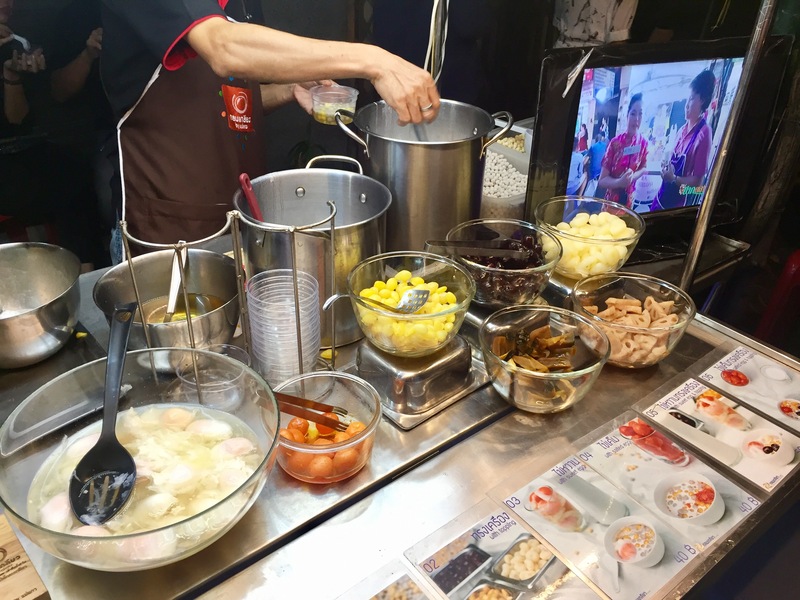 To finish out the night, we strolled a few minutes down the road to another favorite from Round 1 in Bangkok at MBK mall. 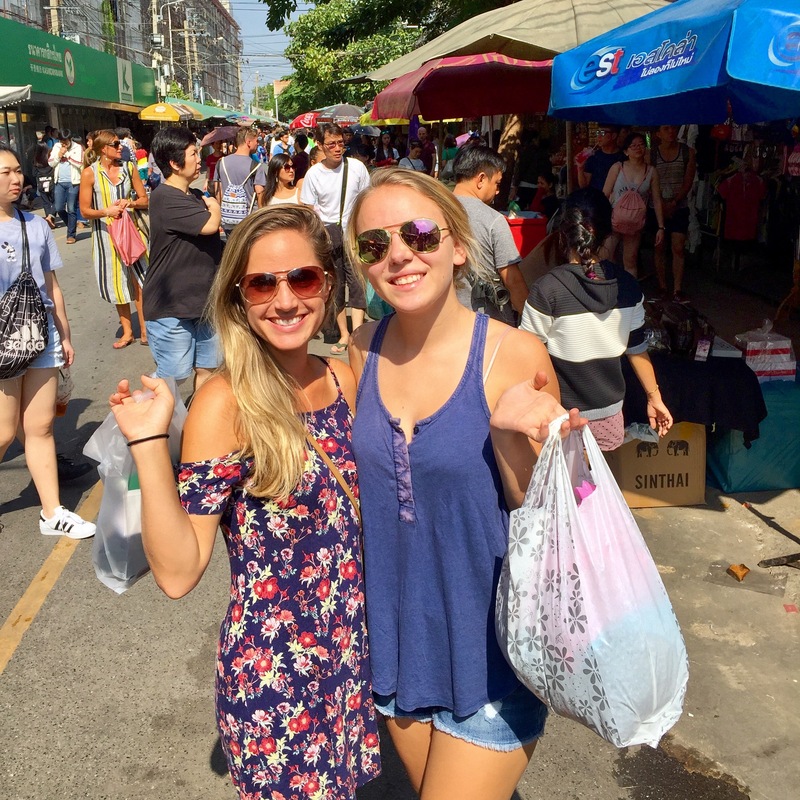 We led Lilli around the outdoor food market and picked up a handful of things to end our day of eating and sightseeing. 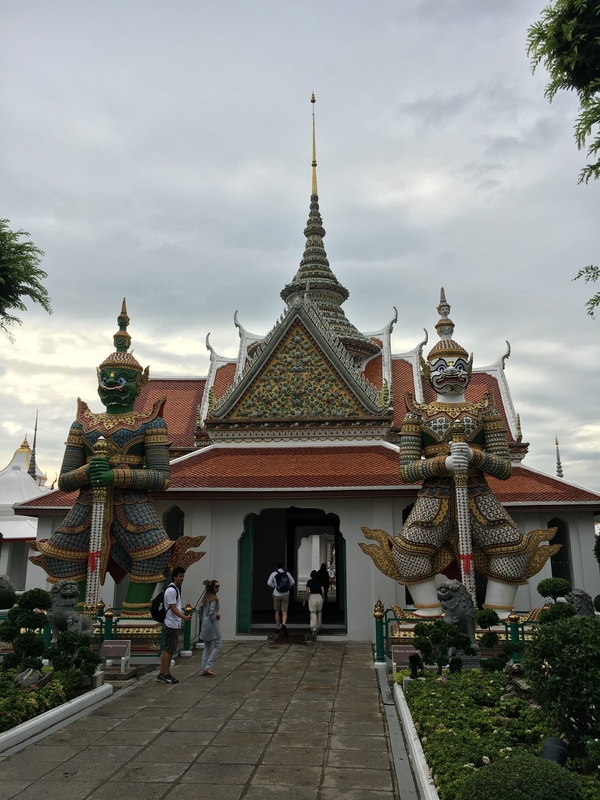 Our second and final day in Bangkok happened to be on a weekend, which meant we were heading to Chatuchak Weekend Market. Lilli was ready for some shopping and I was in need of some new shoes so it was a perfect setup. (My marathon training followed by months of city walking had really put the miles on my old shoes.) We proceeded to walk though as many shops as we could trying to find the “perfect gifts, at the perfect price.” It felt like a full day even though it was only lunch time when we were ready to find some AC. We grabbed a so so lunch nearby, bought our last couple souvenirs then caught the train back to…you guessed it, the mall! We were definitely not in the mood for more shopping, but the AC was perfect. Plus, just across from the mall was our favorite masseuse, Lek Massage House, where we would once again settle in for another luxurious $9 massage. 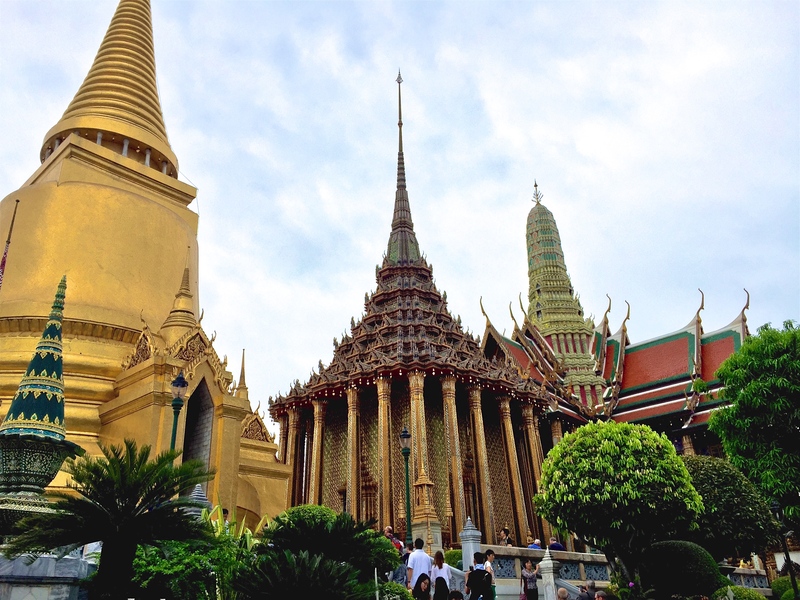 This time we splurged for a 90minute 500baht ($15) experience and we were in heaven as we left. To bring Round 2 to a close we still had a lot we wanted to do. 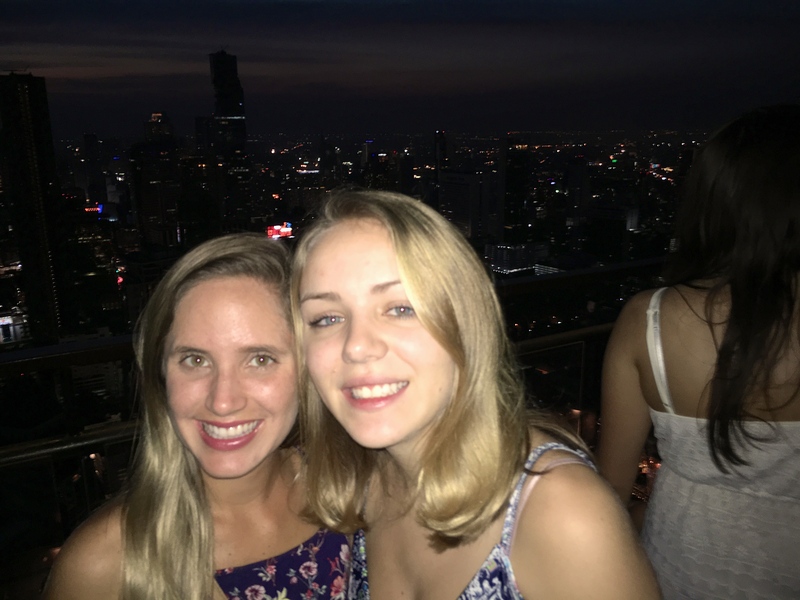 We left our massages, caught a taxi to the hostel, and got ready for a night on the town. 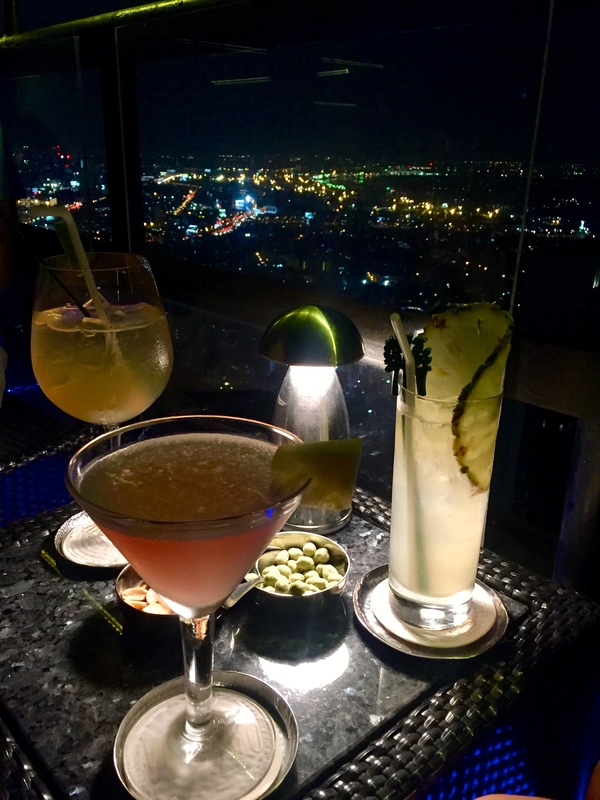 Our friend Andrea of BestWorldYet recommended Vertigo and Moon Bar on rooftop of the Banyon Tree Hotel to catch the last rays of sun with a fancy drink in hand. With only the best tips coming from her we headed straight there just as evening was approaching. 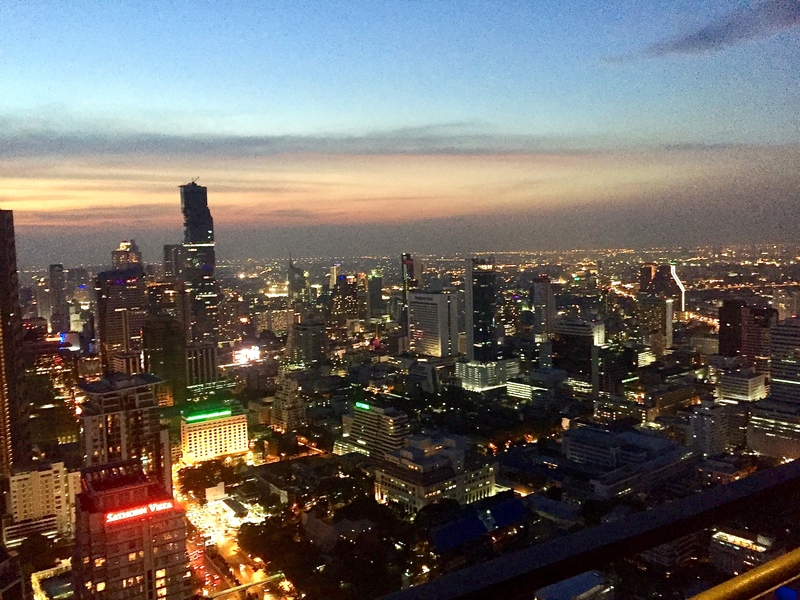 The taxi didn’t quite know how to get there, so we didn’t make sunset, but the evening skyline was still breathtaking. Consistent with my other New York City references, we felt like we were back in the Big Apple looking out in all directions. 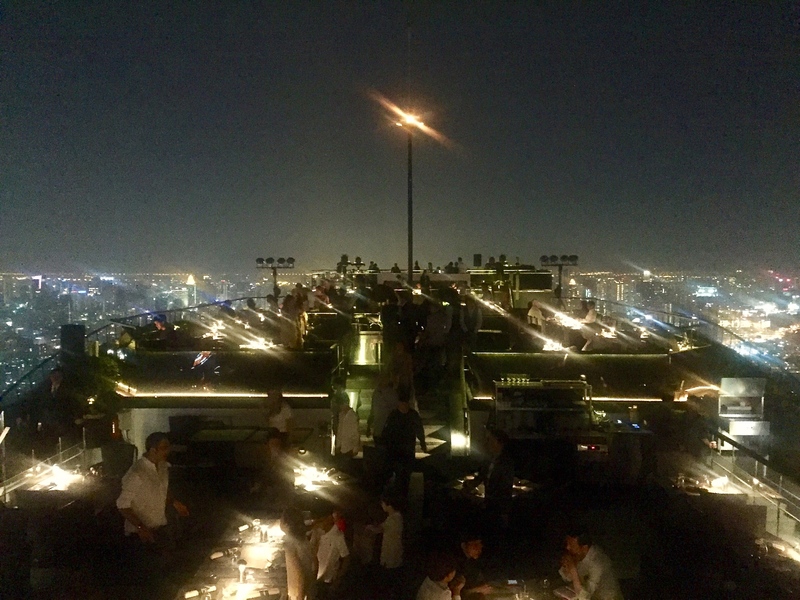 We couldn’t afford more than one drink on the rooftop so we didn’t actually stay long. Instead, we ventured over to Chinatown for dinner. Last time we were in Chinatown it was a Monday and apparently many people take Monday off from the street food business. Since it was a weekend, the place was packed with all the “restaurants” the sidewalks could hold and we soon found ourselves ordering some tasty seafood dishes that I only gawked at last time. 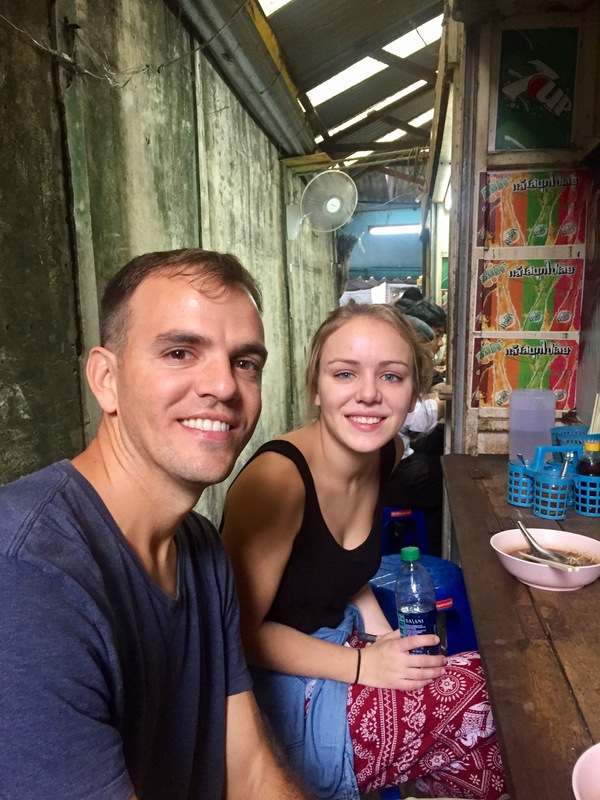 Now, with full bellies and only one more place to go we caught a tuk-tuk to Khao San Road. 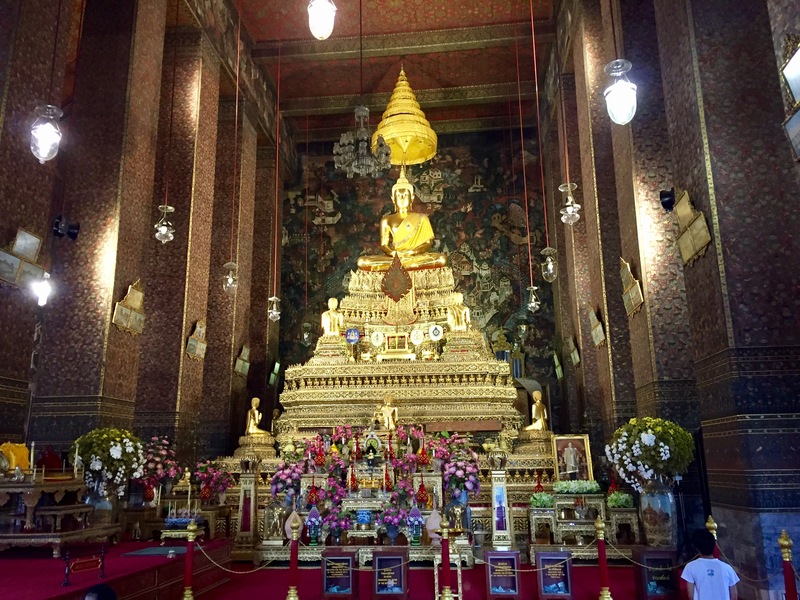 As promised in Bangkok Round 1, here’s what it was like. 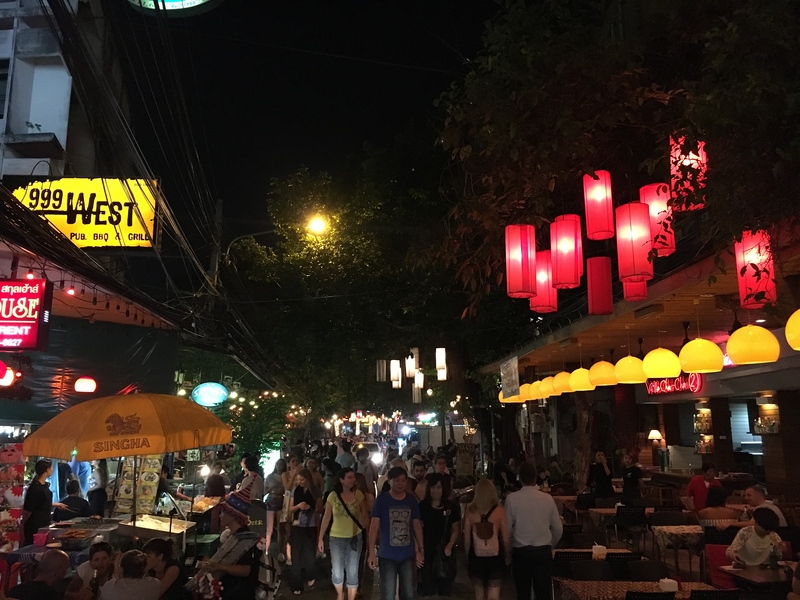 We first strolled down Soi Rambuttri which runs parallel to Khao San Road and is best know for some of the restaurants that the tourists frequent. 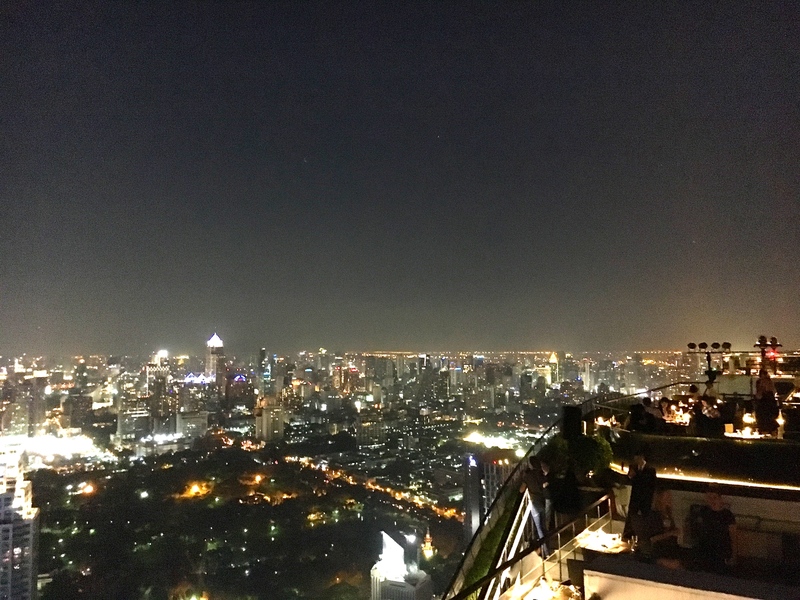 It has a nice dinner atmosphere amongst the madness of the area and probably a good place to visit before heading to the party. We continued on around the corner and knew instantly we had found the true party scene. Right on the corner before even turning onto Khao San Road there is a crowd of drunken tourists stumbling into the road hoping a taxi is willing to drive them to their respective hostels. (Most just drive right by or should I say around them). 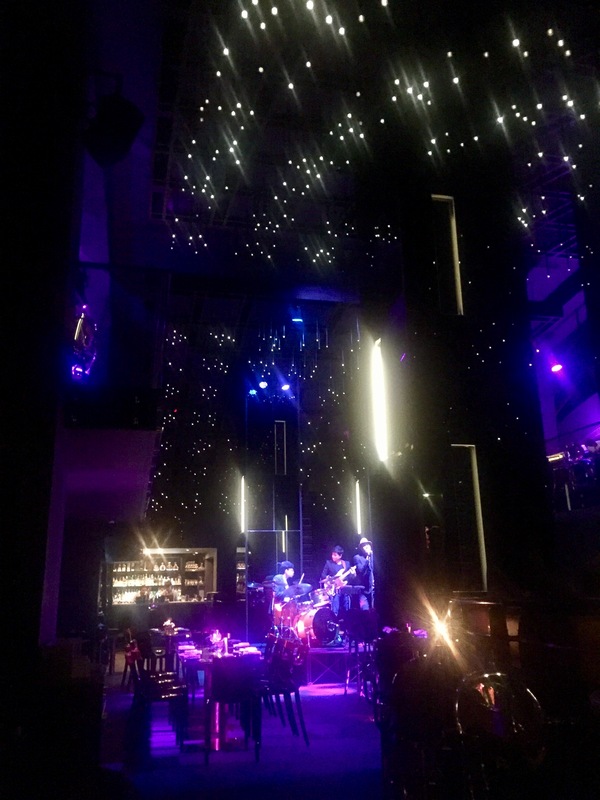 As we walked down the street, the music from each of the bars blasted their competing mixes of heavy metal, rap, and techno music to entice the partygoers stumbling along. I hate to say it, but I’m a little old for that sort of thing, but the people watching is always entertaining. 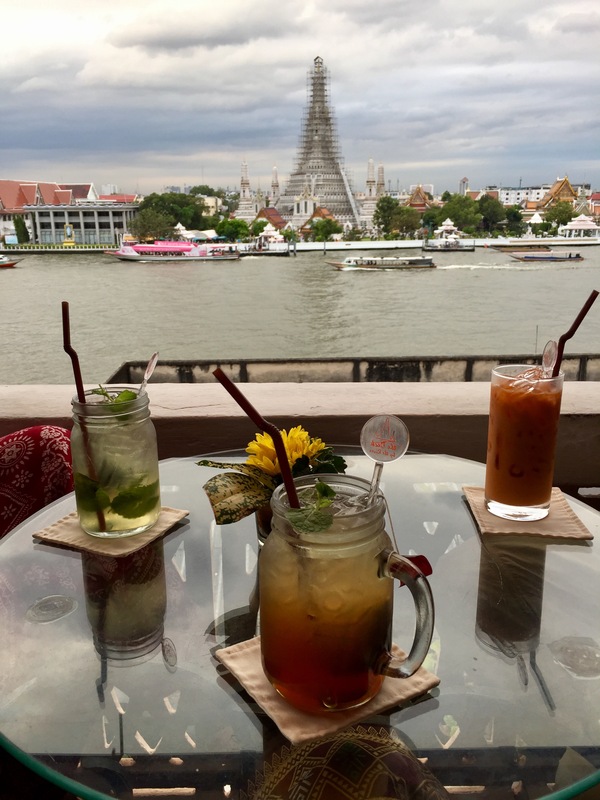 We slowly strolled along, turning down the famed “bucket drinks” where you get what looks like a half pint of liquor with some mix for only a couple hundred Baht (or a few US dollars). Our upcoming 6am bus kept us from spending too much longer people watching, so we made our way back to d Hostel to get a few hours of rest. Just to be clear, the remnants of the party were still there when we passed through to our bus at 5am. There were even a number of people still going “strong” at some of the makeshift tables on the sidewalks. I shudder at the thought of ever trying to do that again. 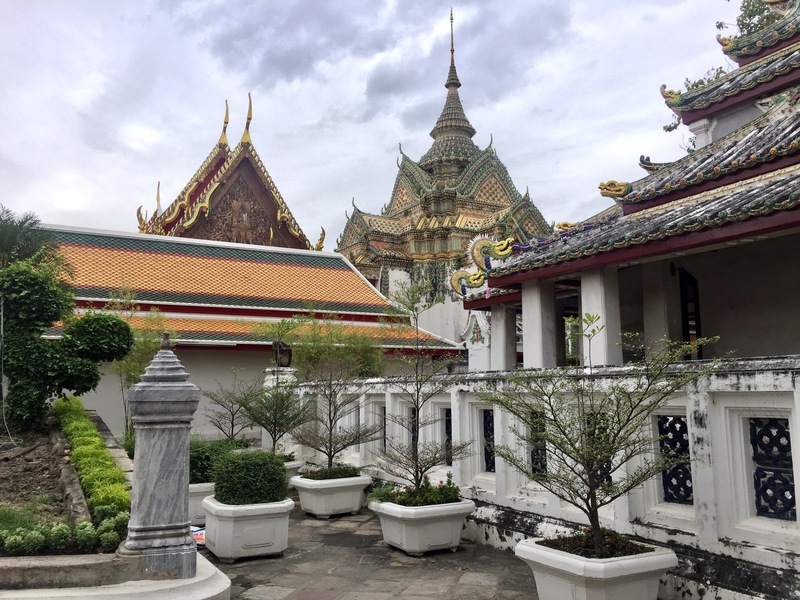 Bangkok was one of our favorite places so far in Southeast Asia with the variety of things to see and do, while reminding us of a bit of home in NYC. We will definitely make our way back here sometime for a little shopping and definitely some eating. For now, it’s on to Koh Tao for a bit of diving.